SNAFU! 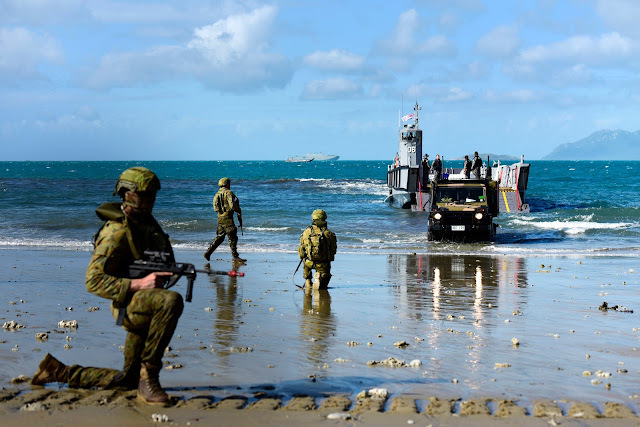 : Australian Army continues to develop its amphibious capability alongside US Marines at it's "Sea Series" Exercise. Australian Army continues to develop its amphibious capability alongside US Marines at it's "Sea Series" Exercise. Australian Defence Forces provide security as vehicles come to shore via Light Landing Crafts as part of Exercise Horizon in Bowen, Queensland, May 28, 2018. U.S Marines from Marine Rotational Force – Darwin are working with the Australian Amphibious Task Group during the Exercise Sea Series. The Series consists of command exercises, infantry sea routines and culminates with an amphibious assault. I really expected Australia to be sprinting by now when it came to developing their amphibious capability. But their high command seems to be taking a VERY cautious approach to the whole thing. Unfortunately for Australia I don't see them cracking the top 5 of military forces in the region for the foreseeable future. The Chinese, S. Koreans, Japanese, Singapore, Thailand and several others are just too far ahead when it comes to amphibious forces.